A real reunion was held on Saturday 11th September 2004, in Childs Hall. It was organised by Brian Jones with the help of others, who would be very pleased to hear from any past members of RUUFDS. See the Contact page for details. We would like to make this site into a virtual reunion, and use it to collect pictures, stories, and other snippets related to RUUFDS. We have sent logon details to every ex-RUUFDS member that we know of, so if you got missed please let us know. Once you have an account you can create pages here and upload pictures if you can scan them in. 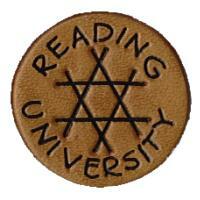 You might also be interested in the Reading University Alumni pages. You cannot edit this page, but once you have your logon details you can edit almost every other page on the site, so get writing and tell us what you know! The Members page tells you how to get started. Why a reunion in 2004? As far as many of us from the 1960s were concerned the English side of the society was founded in 1964 - so 2004 is our 40th aniversity. It turned out that this was only partially true. We knew that the University Scottish Folk Dance Club had kept going - which was why the founders didn't have too much difficulty getting a union grant. But in fact the English side had only folded a few months beforehand at the end of the 1963-4 academic year. Iris Dale (now Edworthy) came to reunion and explained this. "Country Dance Club has now started English Dancing meetings on Tuesday nights in Andrew's Meetings Room. It has been refounded after being lost without trace last session. English, Scandinavian and many dances returned from America form the basis of their programme. At the moment they rely on records to provide the music, but are looking around for a fiddler and an accordianist." That's it, but before you set off to explore, please read the Important Information page. Topic revision: r22 - 21 Jan 2008, AndrewFindlay - This page was cached on 17 May 2017 - 19:18.